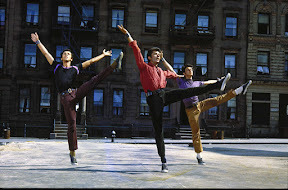 Yet roughly twenty years earlier, Wise’s West Side co-director Jerome Robbins was asked to solve the problem of the man who would become the lover of the Story’s heroine – also named Maria – when a frustrated friend knocked on the legendary choreographer’s door, struggling with an acting class assignment of how to bring Romeo Montague to life. And while it’s never been proven that the “friend” in question was none other than Montgomery Clift*, given the way that West Side Story seems to transcend the musical genre, it’s not surprising to discover that the person who lit the creative match for a contemporary take on Shakespeare’s "star-cross’d" tragedy wasn’t even a song and dance man himself. 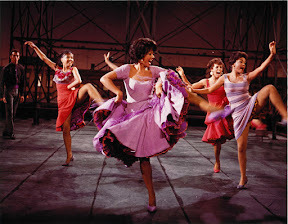 Of course, rhythm and movement was Robbins’ stock in trade so he turned to other avant-garde artists in the field – eager to push the boundaries of what the American stage musical was in the middle of the twentieth century to make something unlike anything that had been executed before. To carry it out, Robbins made a wise decision to enlist the help of playwright Arthur Laurents, whose interest in social consciousness and the human struggles of everyday life naturally lent itself to the contemporary handling of the material. 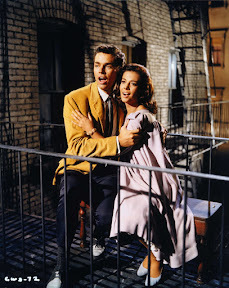 In doing so, Laurents traded in the Bard’s poison of deadly potions to vengeful prejudice sweeping the streets of New York City instead of Fair Verona where he laid the scene of two street gangs (the white “Jets” verses the Puerto Rican “Sharks”) both alike in desperation when an interracial romance between Shark sister Maria (Natalie Wood) and inactive Jet (Richard Beymer) gets in the way of territorial war. 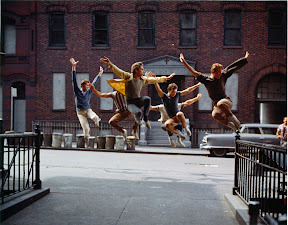 While it’s hard to imagine West Side Story with any one element from music to lyrics to dance to drama removed, it’s amazing to mentally break down the work involved and admire just how ambitious Robbins’ and company were to choreograph steps to that score with just the right lyrics to move the dramatic plot forward. 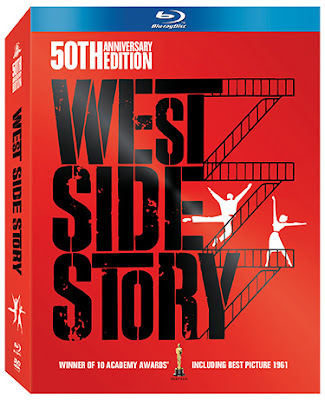 A triumphant collaboration that began with a core team of four including Robbins, Laurents, master maestro Leonard Bernstein and wit plus grit poetic lyricist Stephen Sondheim, when West Side Story moved from stage to screen, editor turned director Robert Wise and award-winning scripter Ernest Lehman were added to the mix. Anchored by composer Leonard Bernstein’s daring score which married the sound of smoke filled jazz clubs with the sweet sounding perfection of symphony hall -- the staggering soundtrack jumps octaves and time-signatures every few measures. And similar to the way that the poetic language of Romeo stays with us the most, in a musical fusion blend of sight and sound, Story adapts and transforms the poetic language of the Bard’s iambic pentameter to do the same by giving off the impression of spontaneous improvisation in all areas including song, dance and free-flowing camera movement. Given that the sound level of the music was always a point of contention for Bernstein – considering his famous dislike of the triple sized orchestra used to record the score to rather unsubtle effect – it’s safe to say that he may not have been overjoyed by the overwhelming and at times downright ostentatious 7.1 high definition audio track on the film’s 50th Anniversary Edition Blu-ray debut. Drowning out everything from some of the individual singers to the overall dialogue, even though the theater-level soundtrack tends to blast you out of your chair more often than you’d like in countless efforts to scramble for the volume control, the sheer majesty of this Criterion quality, scratch and flaw free pristine 1080 pixel image resolution will leave you speechless. Giving other MGM/Fox Blu-ray transfers a run for their money, from Story era classics like Sound of Music to Fiddler on the Roof to contemporary classics like Moulin Rouge!, this three-disc Blu-ray/DVD combo pack is a must-own musical collection, complete with a fascinating Memories documentary (roughly ten years old) that includes vintage footage and rare clips and recordings including pretty if underwhelming performances of beloved tunes by Natalie Wood herself. 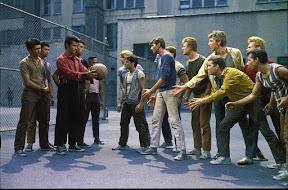 While the topic of prejudice will never stop being vital to us, 1961’s ten-time Oscar winner West Side Story is a vibrant reminder of just how important it is to teach the next generation lessons of acceptance and diversity before they learn them on the street whether it’s on the Broadway stage, on the page with the Bard or with a Blu-ray player hooked up to a HD screen.